Home > Tasting Wine	> Should You Decant Port? “Do you decant Port?” is a question that often arises in whispered tones. Though literature on the subject of decanting this special wine is extensive, most folks aren’t aware of it, and those who are are often scared off by the seeming complexity and effort such decanting–and timing– entails. The other night I enjoyed a fantastic glass of Dow’s Late Bottle Vintage Port from 2000. Though bottled in such a way to avoid getting sediment in the bottle (and supposedly not requiring decanting), this “meant to be enjoyed immediately” quasi-vintage Port underwent a decanting miracle. With a complex bouquet of wild berries, floral notes, and even a hint of caramel, this rich, full-bodied wine was a symphony of plum, black cherry, fig, apricot, and even dark chocolate on my tongue. Providing a satisfying, long-lasting finish, this exceptional wine made quite the impression! Interestingly enough, my friends who brought the bottle over were astonished that this was the same wine they selected; it was one of their favorites, too! Apparently, they had never decanted their Port before, and were experiencing its magical transformation via decanting for the first time. Once opened, slowly and calmly pour your Port into the decanter of your choice being careful not to stir up the sediment at the bottom by moving the bottle back and forth too much. Do this in a well-lit area, and with a clear decanter such as a Riedel Vinum Magnum Wine Decanter, so you can see what you’re doing. When you observe the deposits rising to the neck of the bottle, stop pouring. If you’re insistent on drinking the little bit of remaining sediment-rich wine, an unbleached coffee filter can be used. 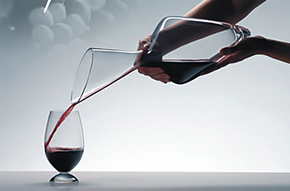 With practice, your decanter will be filled by a majority of sediment-free wine. 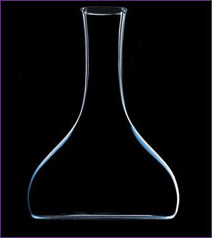 Once in the decanter, let the wine sit for a few hours. Typically, Vintage Port less than 20 years old should be decanted for 2 hours more more before drinking. Vintage Port less than 10 years old requires more oxidation and should be decanted for three or four hours. Older bottles are more difficult to gauge because of numerous variables. That said, 40 year old bottles should receive one hour of air time, and older bottles can be decanted and served immediately. Opinions on the proper amount of decanting time do differ, but I find these guidelines appropriate for the most common circumstances. In short, decant your Port! You’ll be amazed at how good it can be. The age of a Vintage Port is important concerning how you decant the wine. 20 year old vintage Port is lovely to decant because, if it has not been moved, it will form large pieces of sediment. Vintage Port that is 7-12 years old will be throwing some sediment, however the particulates are very small. If the wine is not decanted properly you will notice your young vintage will be cloudy in the glass and the particulates can distort your experience slightly. To avoid this I find standing the bottle for 2 days and passing the wine very slowly through a thicker than usual cheese cloth (folded more times) works a treat. It is important not to decant the whole bottle. Leave an inch of wine/sediment in the bottle. Slow Cooked, Summer Ribs in Red Wine Wine in a Box? How Fancy!